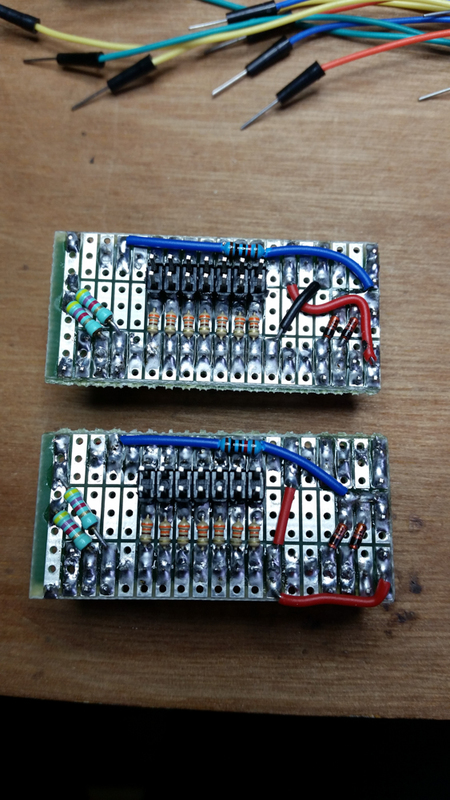 Having many 18650 battery cells to charge, I bought a few dirt cheap TP4056 modules (0.22 EUR per piece) and discovered that they are "not designed for" reversed polarity cells. In other words, reversed battery = instant magic smoke. 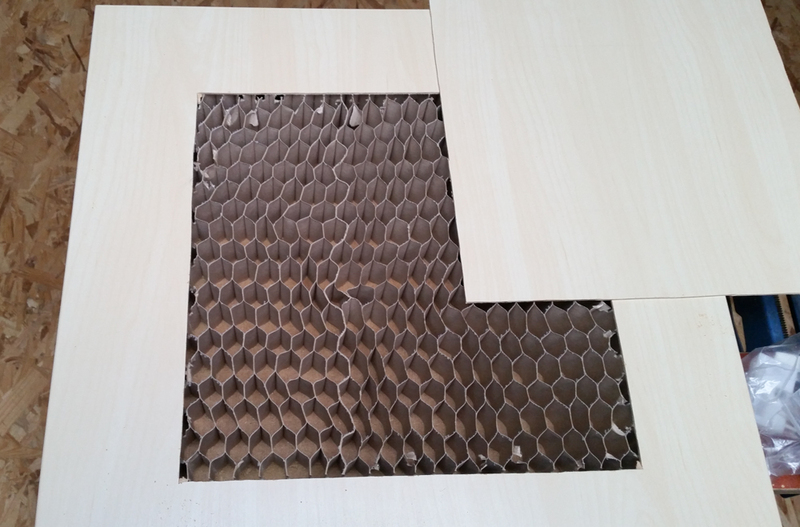 Q: "Has anyone actually tested this solution in real life?" So I thought I would test and share the results here. 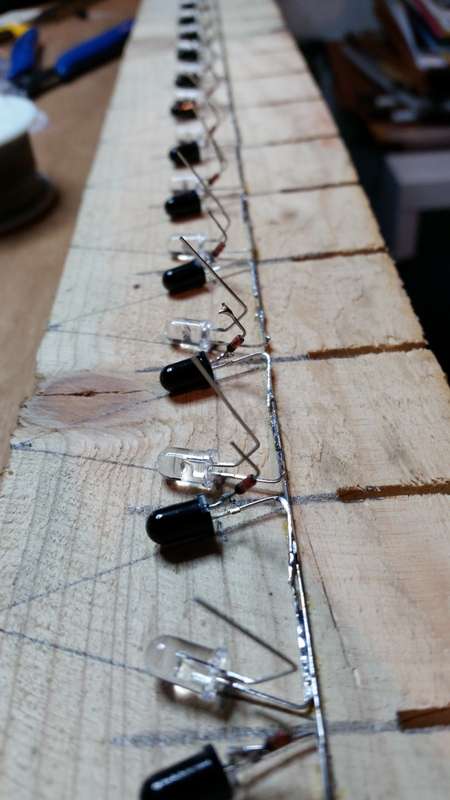 Note: Sorry for the audio quality of the videos, they are almost straight from my phone and I chose to spend more time on writing rather than on video editing... Also please don't take into account the aspect of the assembled circuits, remember these are quick and dirty tests. The naive logic is that the diode only allows the current to flow "in one direction", but this logic is flawed because the battery is not a load (a random circuit) that we want to protect from a reversed voltage source, the battery is a voltage source. In other words, we don't want to protect the charger from a battery with a voltage > 4.2V that would make the current flow from battery to charger, instead we want to protect the charger from a battery with a voltage < 0V (reversed). 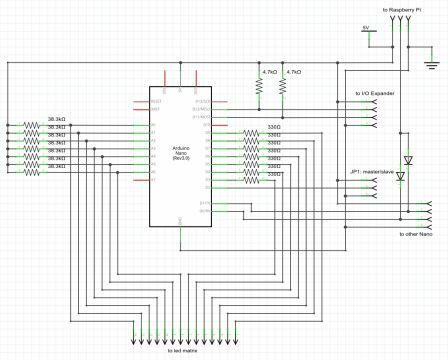 If the battery is reversed, the current will not be reversed: it will still flow "clockwise", but both the battery and the charger will "push" it the same way, and the diode will happilly let that happen of course. Current will skyrocket as if there was no diode, and magic fume will come again. 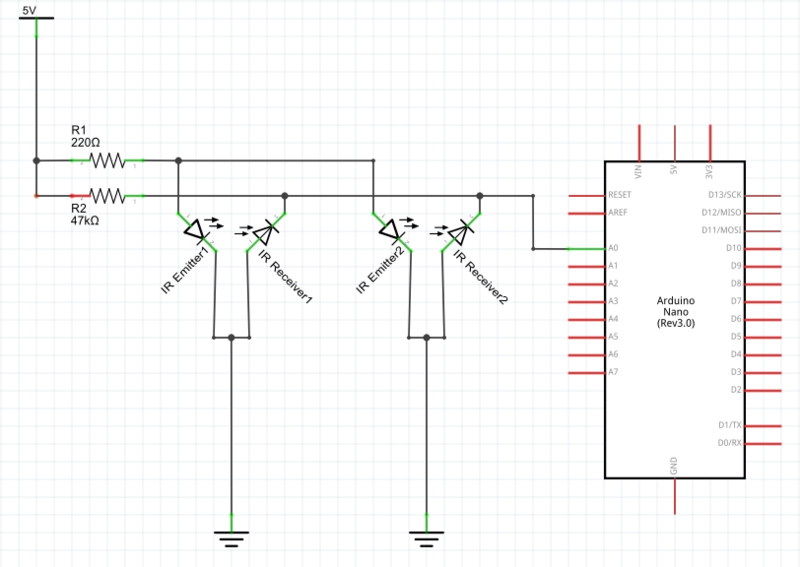 Moreover, when the battery is correctly connected, this solution is not good either because even with a very low forward voltage diode (e.g. 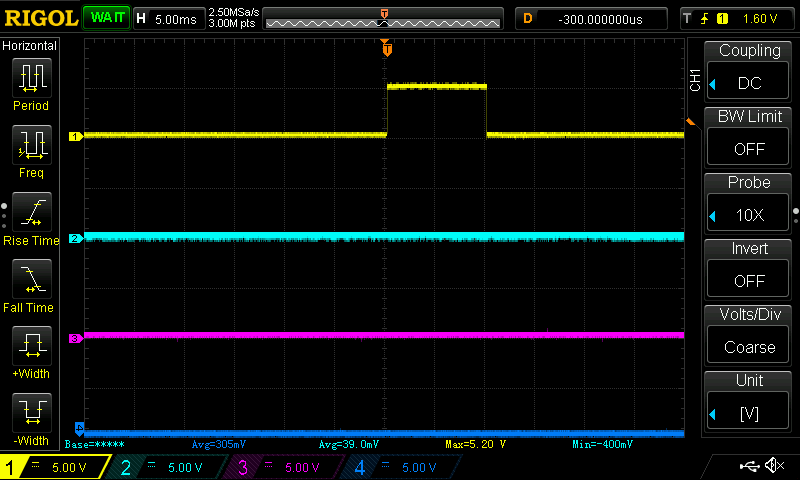 0.4V with this shottky diode), that voltage drop in series with the battery will make the TP4056 think the cell has reached its 4.2V when it's really only at 3.8V, and the battery will never get fully charged as it should. Verdict: That solution is BAD. It doesn't solve the problem and adds other issues. 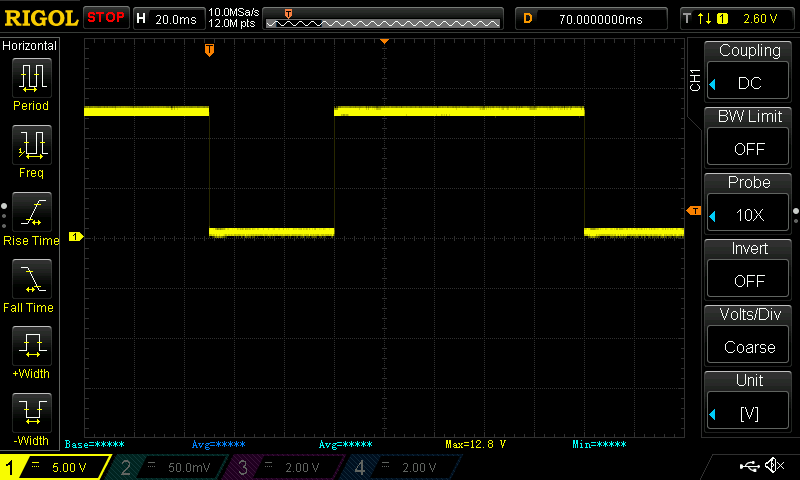 The logic here is that we place a (normally reverse-polarized) diode in parallel with the charger's output. 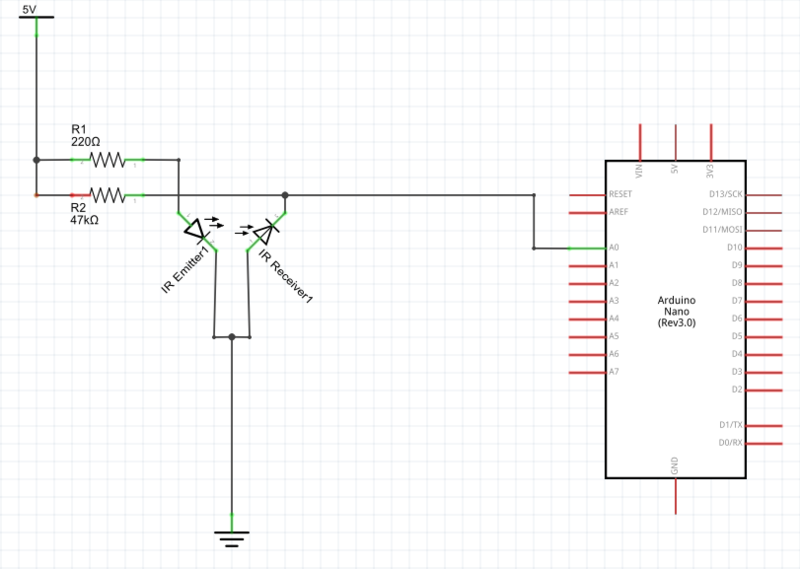 If the battery is connected the right way, this diode is blocking and does nothing. But if the battery is reversed, that diode will basically short-circuit it, causing a current surge through the battery. 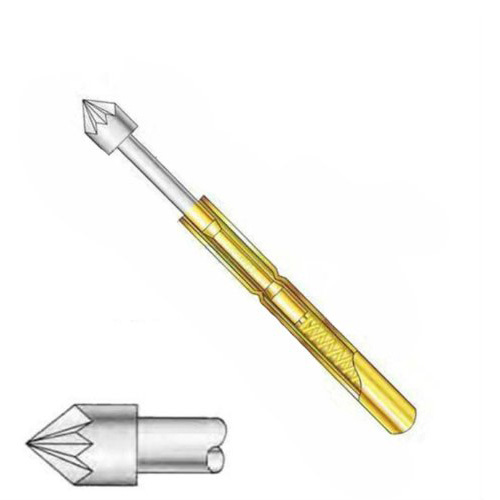 A fuse between the diode and the battery will then blow and "disconnect" the battery, saving both the battery and the charger. The first problem is that, as explained, a current surge is required for the protection to trigger, so even with a fast fuse, a current surge WILL happen. 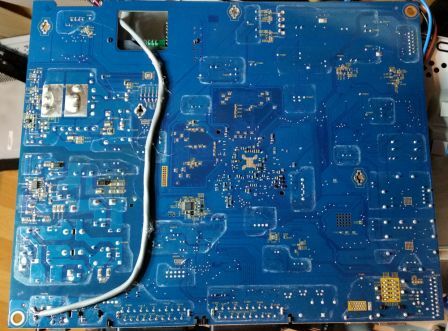 Moreover, during that surge, the diode will short circuit the battery, but also the charger (effectively, the charger will see the forward voltage drop of the diode). Only a test will tell if the charger survives that short-circuit. 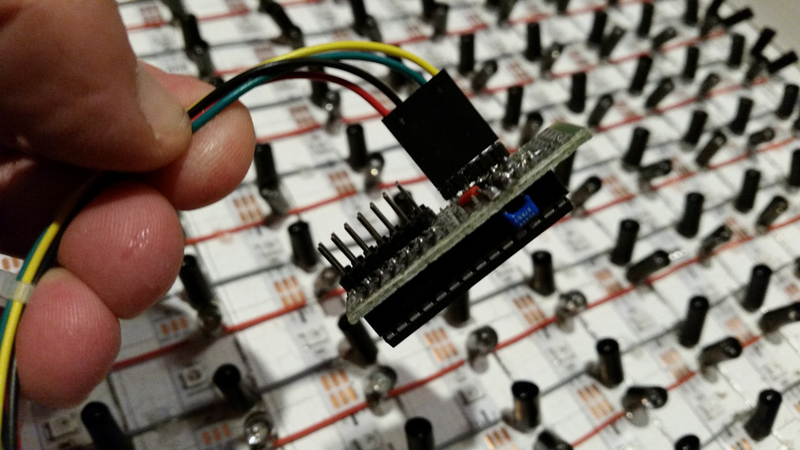 Now if the "fuse" is an actual "single-use" fuse, it will have to be replaced each time a battery is wrongly inserted, and one might wonder if it's worth the hassle, because TP4056 modules are almost as cheap as the fuses themselves :-). The other option is to use a "Polyfuse" or "Polyswitch", acting as a resettable fuse. Technically, it's a temperature-variable resistor (PTC) which would ideally have a 0-ohm resistance at ambiant temperature, and an infinite resistance above a threshold temperature, that temperature being reached when a given current passes through it. As observed, the TP4056 module withstands the short-circuit and is saved by the protection. 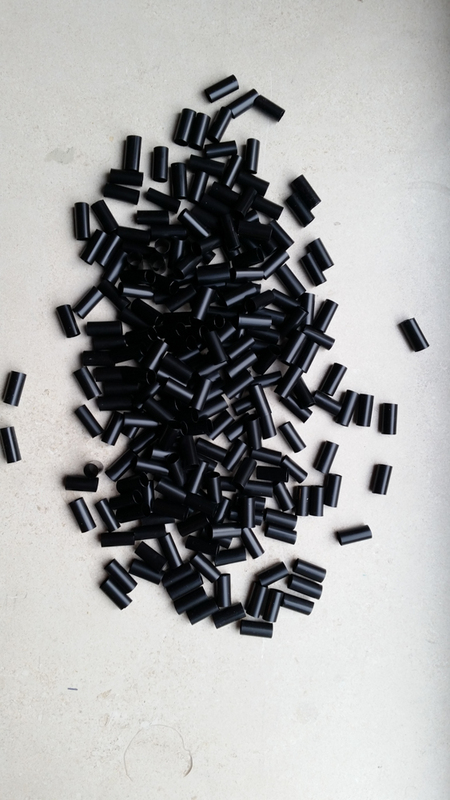 Polyfuses are not ideal though: the current that causes the resistance to rise is not a precise value. For example, the 1.1A polyfuse I used for the test is guaranteed to "hold" 1.1A without triggering ("tripping"), and is guaranteed to "trip" at 2.2A (ambiant temperature, still air). More important, the time it takes to trip can be as high as 5 seconds! So although the cell should not blow, it is definitely not designed to be short-circuited for 5 seconds. Moreover, being a resistor, the polyfuse will also dissipate some power (and cause a voltage drop) when the cell is being charged at high currents. This is not really a big deal because it will just make the charge less efficient. As the battery charges, the current will decrease, and so will the voltage drop on the polyswitch. In the end, we will still get a fully charged cell, even if it takes a bit more time and power than without the polyswitch. 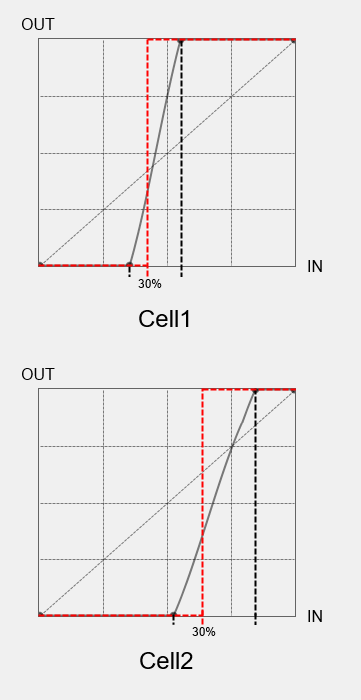 Finally, when the cell is reversed, the polyswitch will continue to limit the current as long as it remains hot, and it will remain hot as long as current is flowing through it. Practically speaking, it means that as long as the cell is left in the wrong orientation, it will get discharged through the diode and polyfuse, with no overdischarge protection... As the battery is probably already empty (why would you want to recharge it otherwise ? ), if you don't notice the issue fast enough, the protection will save the TP4056 but kill the cell. 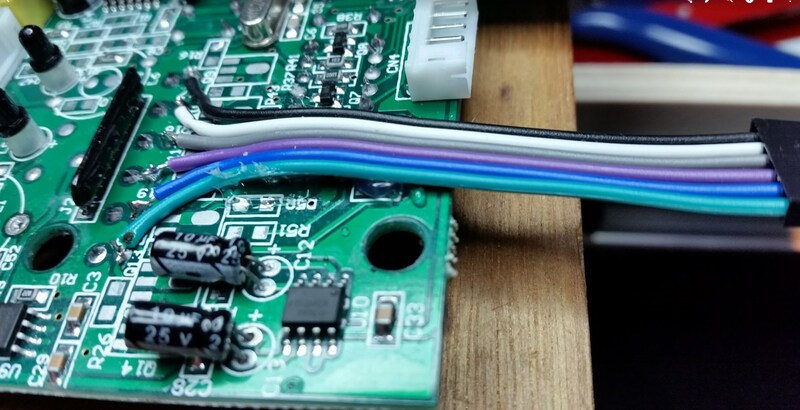 We come back to the idea of "preventing the current from flowing" (as in 1) instead of letting it flow and protecting the charger (as in 2), but we do it the right way this time, using a MOSFET as a switch. 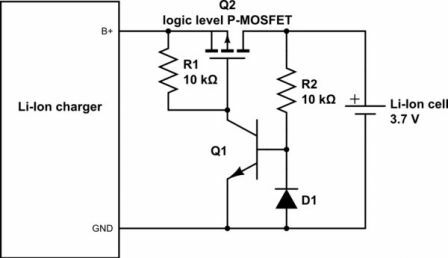 When OFF, the mosfet does not let any current through, effectively opening the circuit like a reverse-polarized diode. When ON, it behaves more like a resistor with a very low resistance, causing a voltage drop that decreases as the cell becomes full and current slows down. That is good. Now, the trick is to have the gate turning the switch On or Off at the right moment. 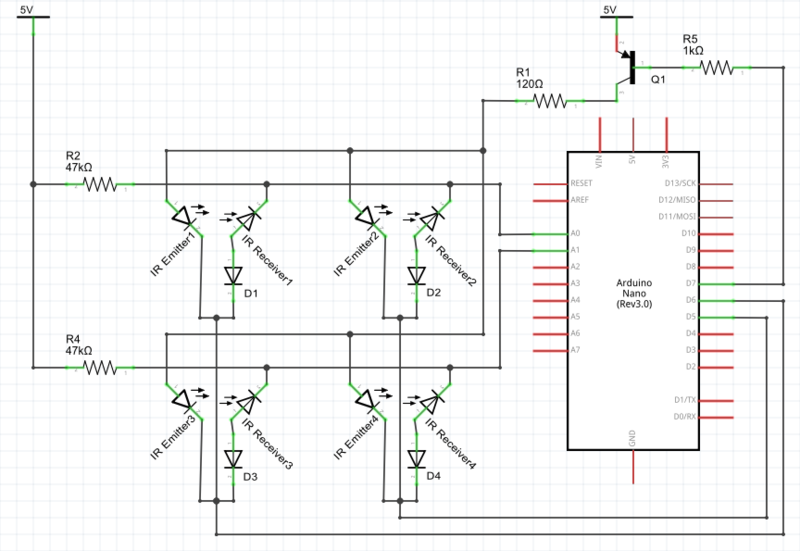 The first thing is to put a resistor from the source to the gate to make sure the MOSFET is OFF "by default", and the second thing is to add a transistor to override that resistor and flip the voltage on the gate when the battery is correctly positioned. As you can see, the protection works perfectly. There is no current surge when cell is reversed, the charger sees no battery connected and uses no current. On the battery side, the current drained from the cell is also negligible. 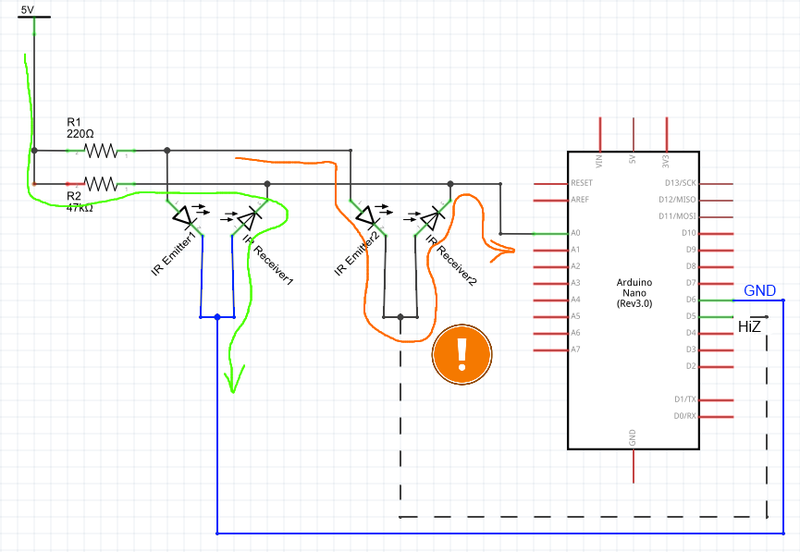 This circuit is clearly the safest one for distracted or careless people like me. 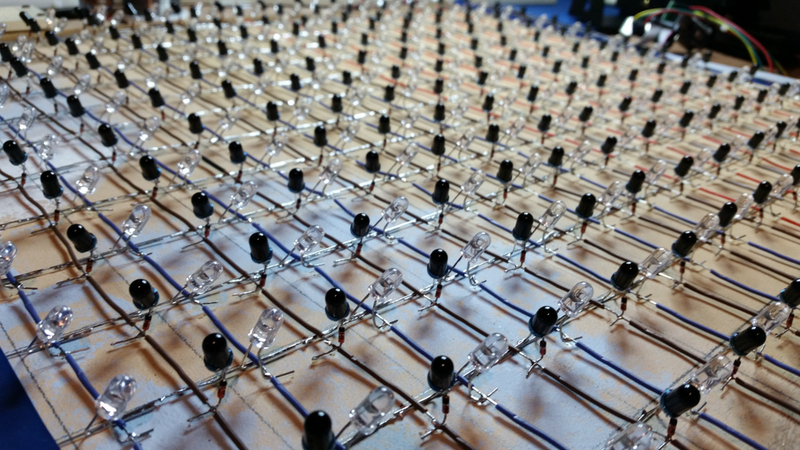 The protection works as before but now, in normal use, the voltage drop across the mosfet is reduced to a negligible value, So the behaviour is almost perfect. 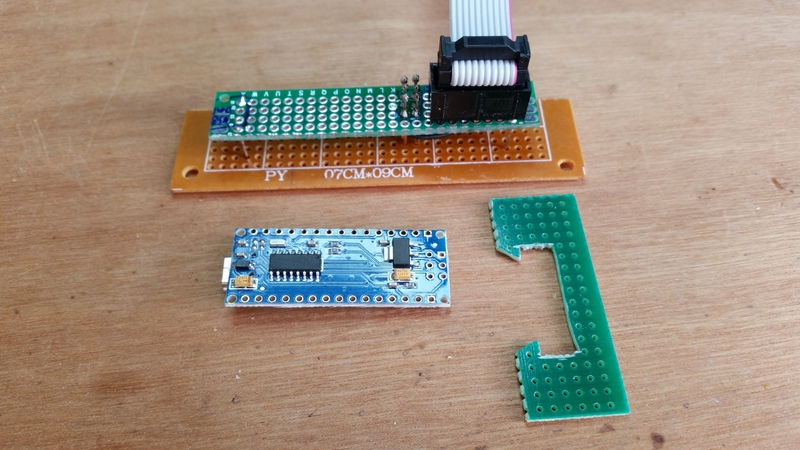 Side-note: although the logic is different, using a N-channel mosfet with a low RdsOn as a switch on the B- connection is also the method used on the "protected" version of the TP4056 module (it's a pity they didn't include the reverse polarity protection while they were at it). 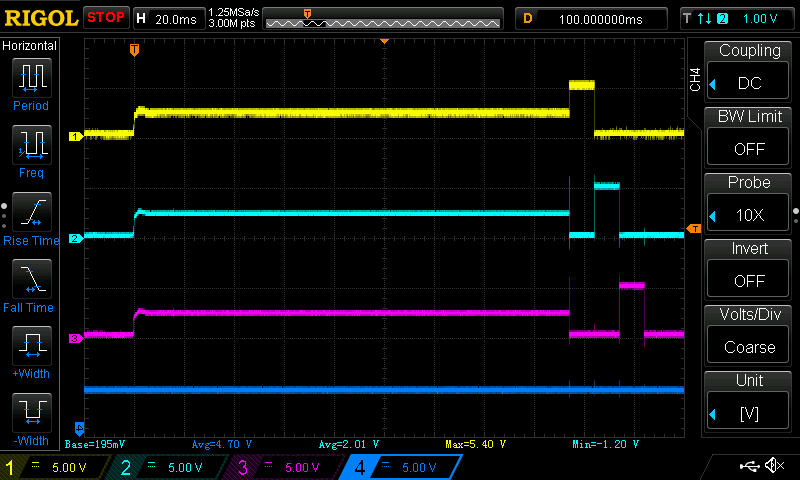 That module includes a FS8205A dual mosfet chip with a typical RdsOn of less than 0.03 Ohm. 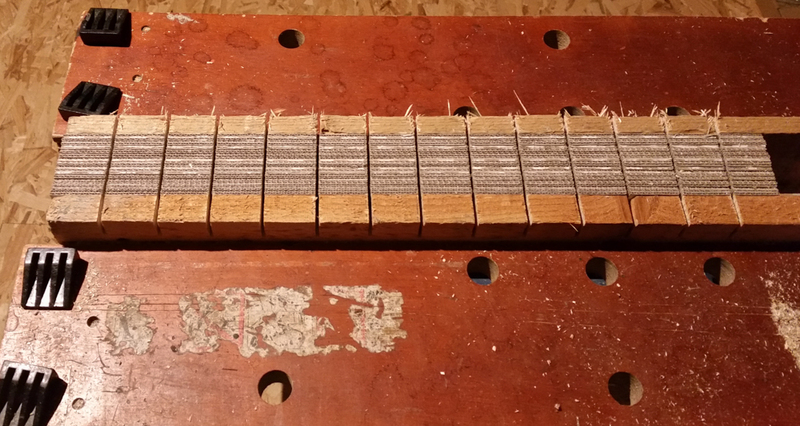 Now I admit I'm a bit puzzled (and always was) about the additional diode. 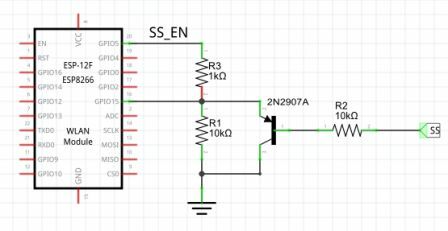 It is found in many circuits dealing with "reverse voltage protection" as a way to make sure the reverse voltage between base and emitter of the transistor doesn't go below -5V (for 2N2222), which would be "out of spec". 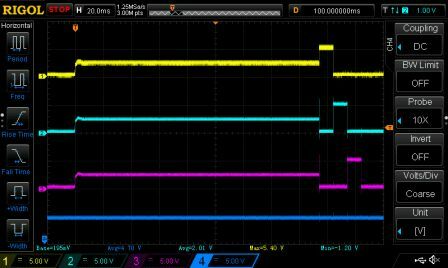 It's just a small diode, it doesn't have to carry high current, it's cheap, so not a big deal, but as we're only dealing with a Li-Ion cell, even if reversed when fully charged, it won't ever go below -4.2V. Note: in any case, it may be a good idea to add an indicator when the battery is connected the wrong way. 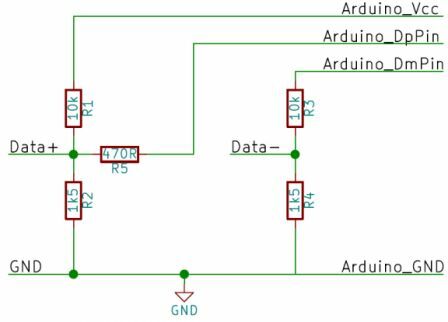 The obvious solution is a LED in series with a resistor, that would light up only when the battery is reversed, but maybe it would be wiser to add an active buzzer in series with a diode. 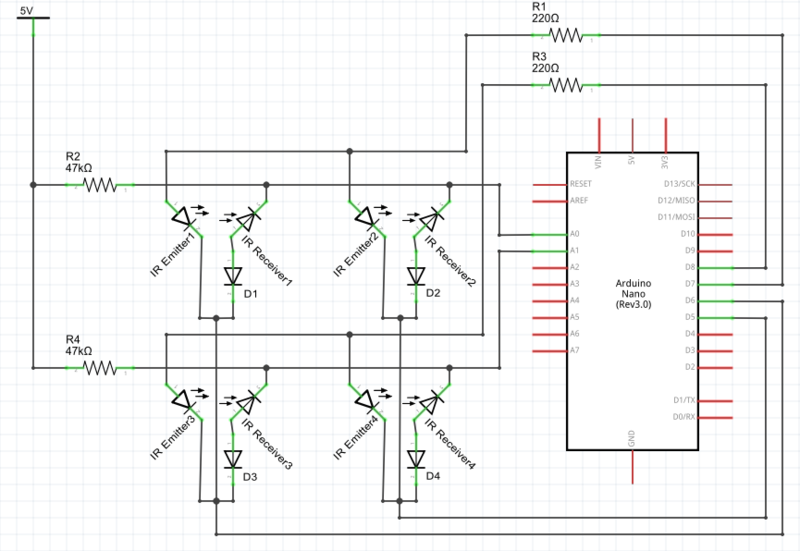 If you build a multi-cell charger, a single buzzer and one diode per cell is sufficient. If you want to share opinions/ideas/chips/rants/etc., feel free to comment in the original forum thread. 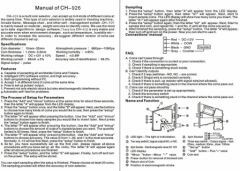 Disclaimer: the following refers to some cheap USB chargers which may not comply with local safety regulations and could pose a hazard. All you do is at your own risk and I cannot be held responsible for use or abuse of those chargers. A few months ago, I stumbled upon a Hackaday post presenting the QC2Control library by Timo Engelgeer (Septillion), which makes it very easy to turn a Qualcomm Quick Charge 2.0 compatible USB charger into a 9V or 12V power supply. 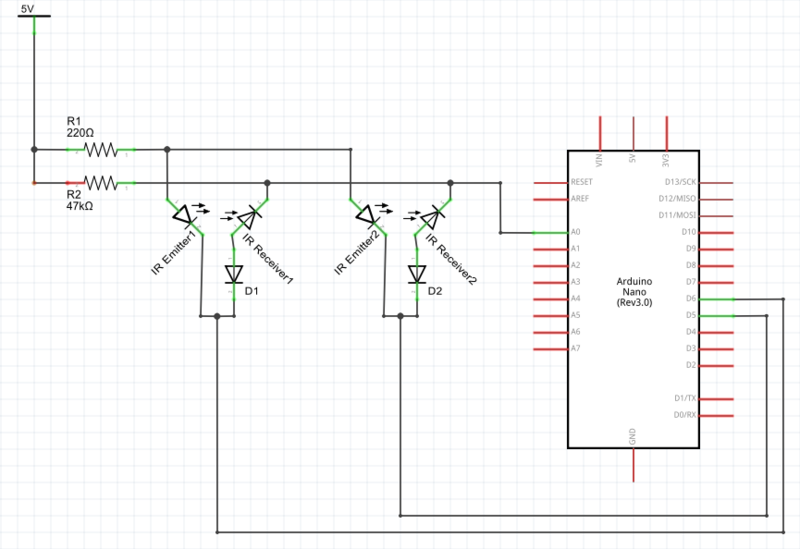 I used that trick successfully to power a small project that required both 5V and 12V, and its simplicity made me want to dig a bit further into Qualcomm's Quick Charge technology. 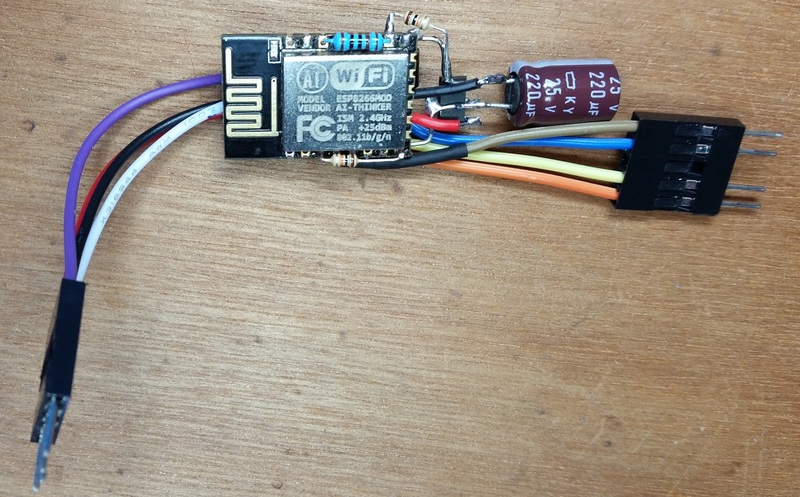 As you may know, Quick Charge 3.0 adds the possibility to request any voltage between 3.6V and 12V (with 0.2V steps), and with some QC3 chargers available for less than 4 EUR, throwing in an Arduino clone and a few resistors make a very affordable way to power devices with custom voltages. Of course, for that price, don't expect top notch precision, protection, or power, but it is more than enough for most DIY projects, and the adjustable voltage can compensate voltage loss in long power lines (think wired sensors far from alarm system for example). and a reputable (Anker) QC3 charger. 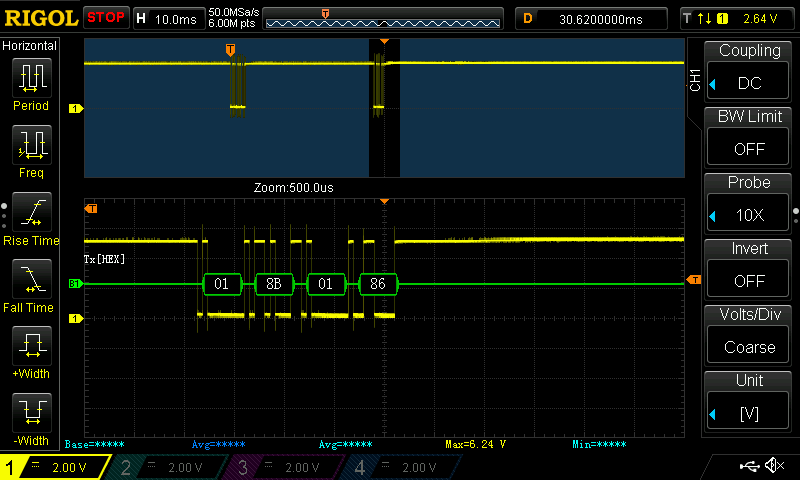 The QC2 charger exhibits a strange behaviour: the QC handshake works and the voltage goes to 12V. 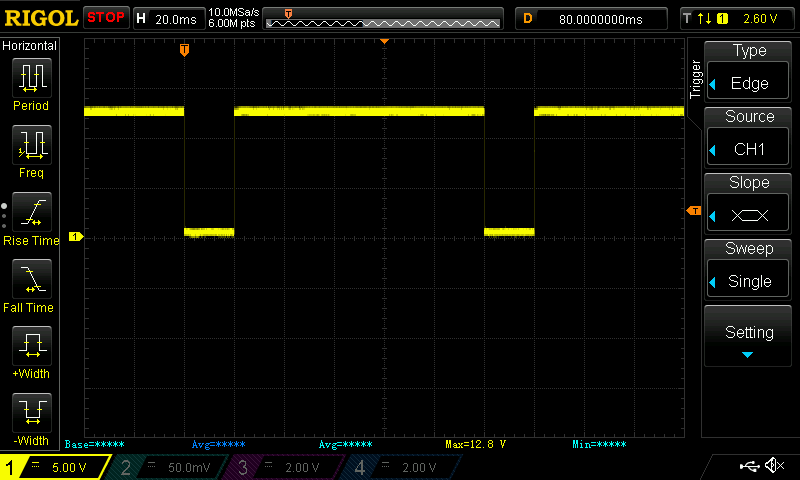 It also successfully generates 9V. But requesting 5V then seems to completely reset the charger, with the output voltage dropping to 0V before coming back up to 5V. However, after the reset, the charger has left QC mode and a new handshake would be needed to get it back on track. Most probably it is a problem with the charger... any information is welcome. To explain, let's first go back to the basics. 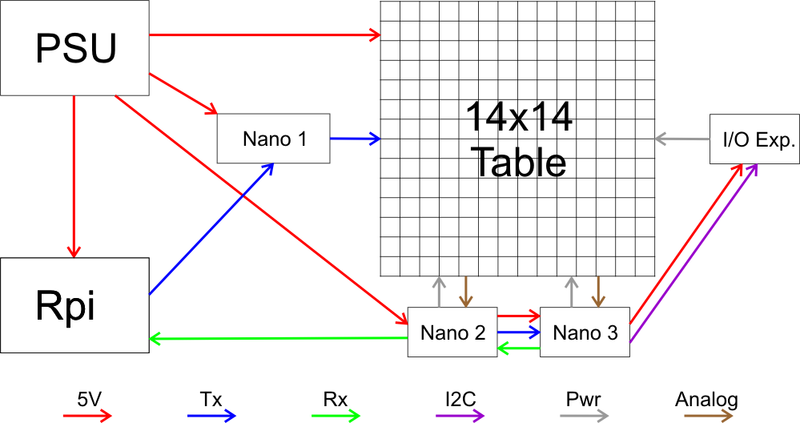 Most of the communication between a portable device (PD) and a USB power source relies on the D+ and D- lines of the USB connection. Of course those USB data lines were not designed for signalling but for data transmission in a differential way: D- going down when D+ goes up (and conversely) and the receiving device subtracting D- from D+, so that if noise or spurious peaks happen during the transfer, they appear on both lines and the subtraction cancels them. But as a charger does not use the data lines, several standards or proprietary protocols were designed using those wires in a primitive way to identify the source or control it. 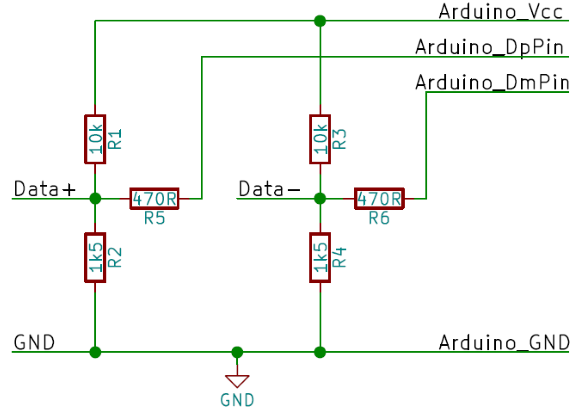 The first convention is that a charger starts with D+ and D- connected together (shorted), which is incompatible with the differential mode, and can thus be detected. 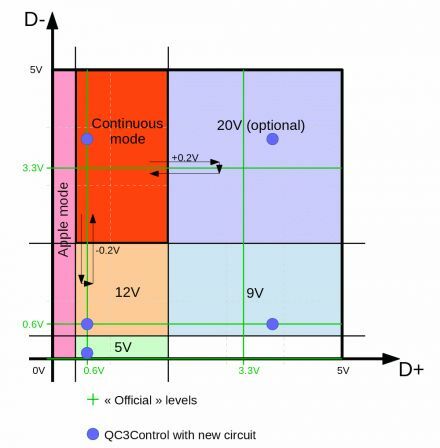 If a PD is QC-compliant, it will set a voltage of around 0.6V on D+ for around 1.25s. 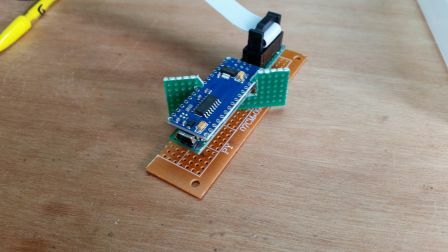 If the USB power source is also QC-compliant, it will detect that voltage, remove the short between D+ and D- and connect a 20K pull-down between D- and GND. That is the QC handshake phase. 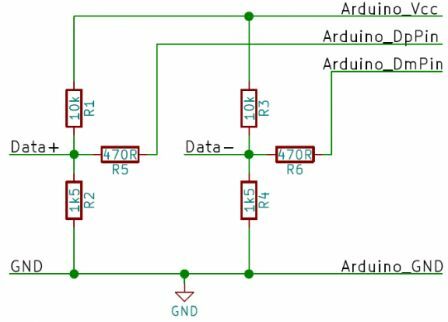 After that, the USB power source will start monitoring the voltages on D+ and D- and will act according to the detected levels. 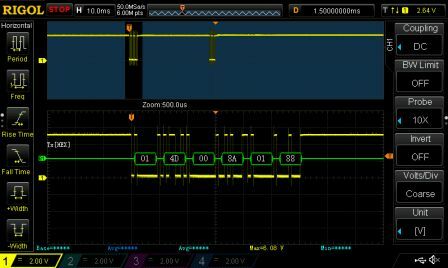 Switching to continuous mode is as easy as selecting a QC2 voltage: after handshake is done, you set D+ to 0.6V and D- to 3.3V and that's it. No matter what the previous settings were, the charger is now in continuous mode (but the output voltage remains the same for now). 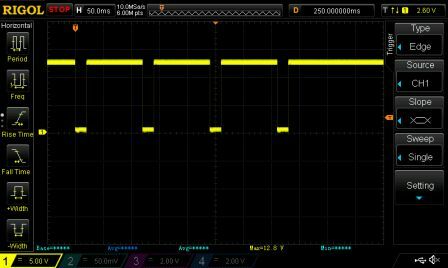 Once in continuous mode, you can send pulses "down" or "right" (see arrows) to respectively increment or decrement the output voltage by 0.2V. 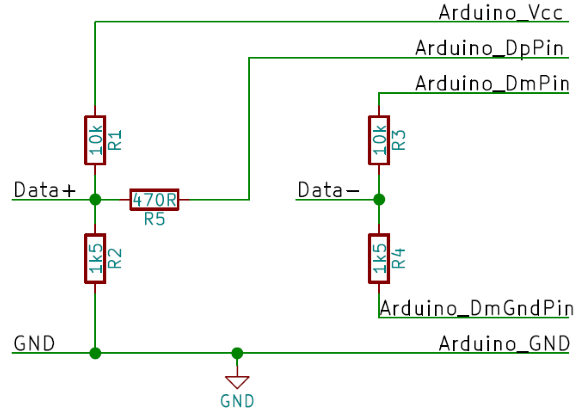 The original circuit, no matter the resistor values, cannot reach the continuous mode quadrant as the voltage on D- must be around 0.6V when Arduino_DmPin outputs 5V. 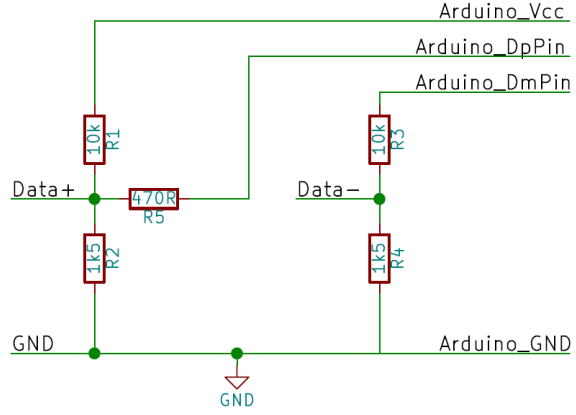 So my first attempt used a slightly modified version, connecting the lower resistor of the D- divider to a third pin of the Arduino (Arduino_DmGndPin) instead of GND so it can be made floating. 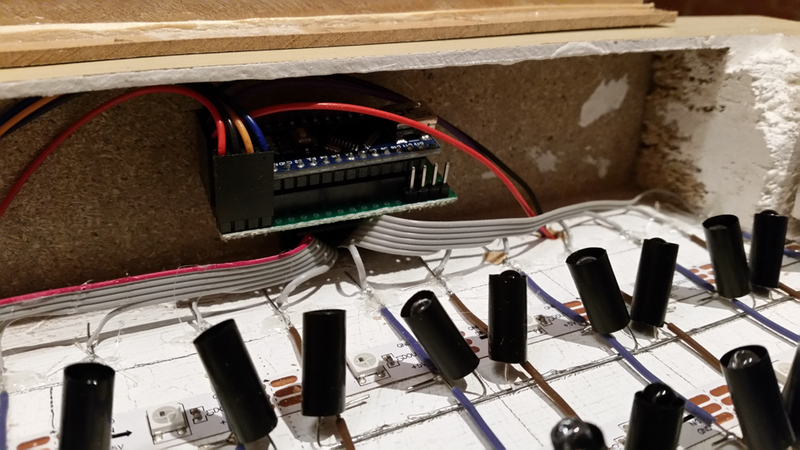 That way, D- can be pulled up (to be precise, when the pin of the lower resistor is left "floating", the upper 10K resistor connected to the pin outputting 5V balances with the 15K pull-up Inside the charger, so the actual level on D- is around 3V). And again, after some coding, I could make it work. To design the Library, I started from the QC2Control project, which is easy to understand and has a clean API, and forked it to add QC3 features. In the end, most of the implementation has been rewritten to work in milliVolt internally, but the API should be fully backwards compatible, with a twist. You can find the code of QC3control on Github here. 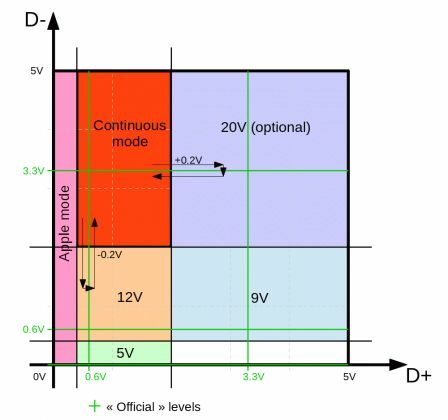 The twist is that while set5V(), set9V() and set set12V() have the exact same behaviour as in QC2Control and request discrete 5V, 9V or 12V mode, **But** setVoltage() now always uses QC3 continuous mode to reach the requested voltage (which is now a 'double' to support decimals). 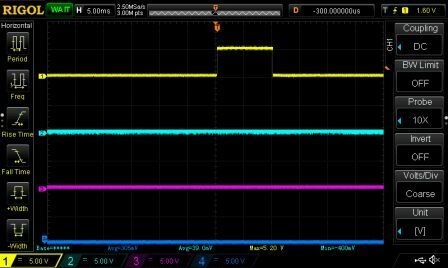 It means that setVoltage() cannot be used with a QC2 chargers anymore contrary to the 3 first functions, but it also guarantees that switching voltage using setVoltage() will always be made in a smooth (monotonic) way. 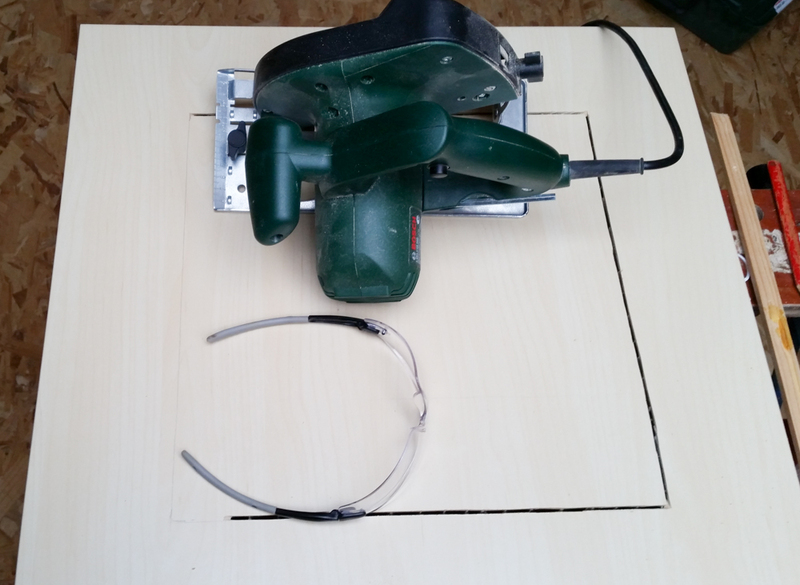 For example, if voltage is now 10V and you call setVoltage(12), a quick ramp will increase voltage by 2V in 10 steps. 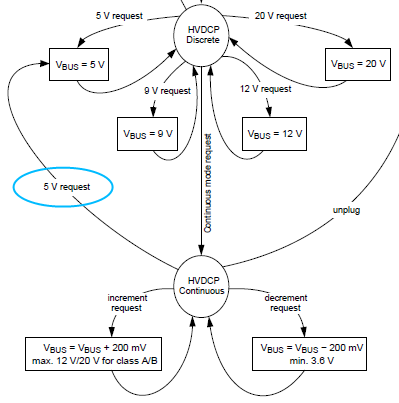 On the other hand, if voltage is now 10V and you call set12V(), the charger first has to leave continuous mode by switching to 5V (see state diagram above) before requesting discrete 12V, which causes a brutal voltage drop. 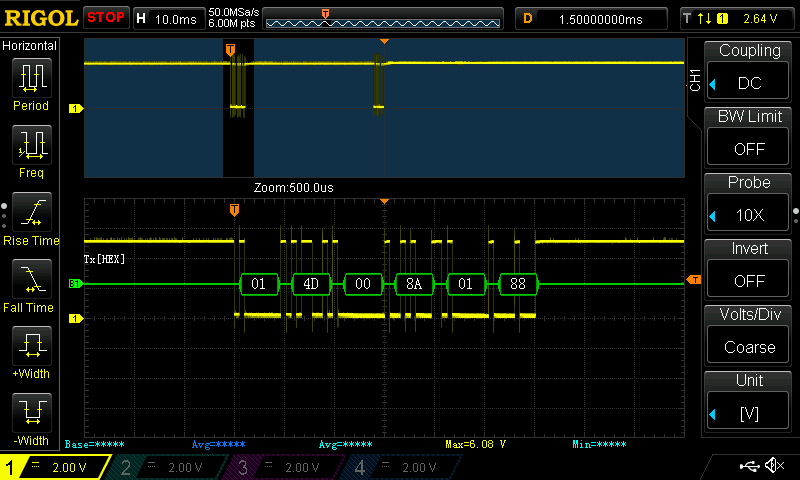 Performance is not affected in a major way by the ramps because each increment (or decrement) of 200mV only takes 2ms, while the discrete mode change to 5V takes 60mV before requesting the new voltage (this might be slightly reduced but I played it safe). In the end, the choice of mode is left to the programmer using the library. 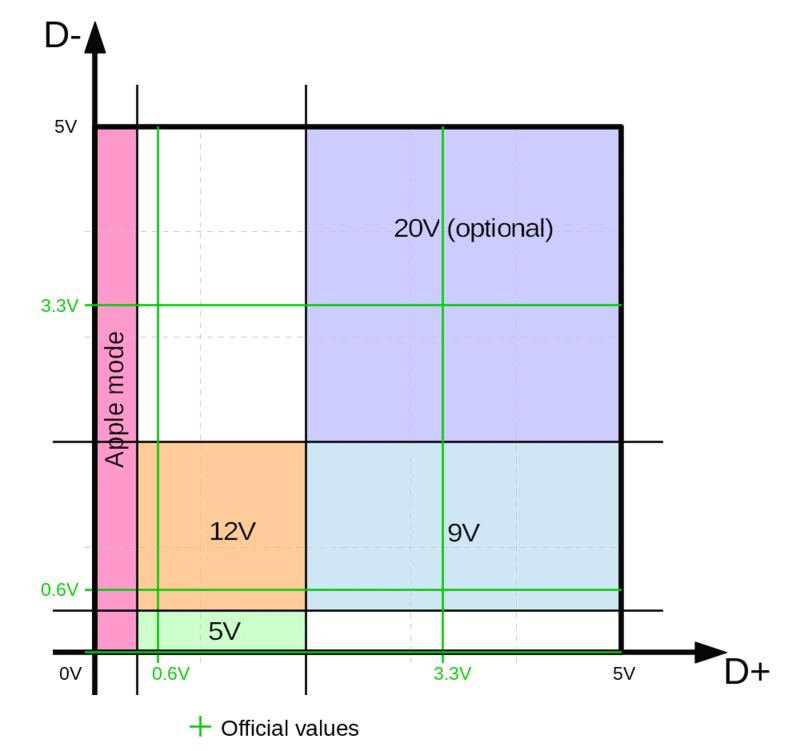 setMilliVoltage() and getMilliVoltage() are identical to setVoltage() and getVoltage() but the unit is milliVolt and values are thus integers instead of double. In my tests, I noticed that the cheap QC3 charger did not go down to 3.6V but instead it stopped at 4V and ignored further "decrement" requests. 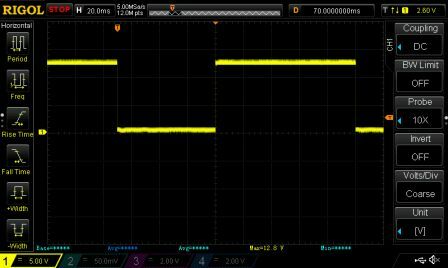 The fact that setVoltage() now uses relative steps instead of absolute jumps means that such offset can impact the full voltage range if you only use setVoltage(). For example, with such a charger, if right after start you call setVoltage(3.6) then setVoltage(9), the actual voltage will reach 9.4V. That's because setVoltage(3.6) issues 7 decrement requests ((5-3.6)/0.2 = 7), of which the last 2 are ignored, stopping at 4V, then setVoltage(9) issues 27 (=(9-3.6)/0.2) increment requests, which causes the voltage to be increased by 5.4V, to 9.4V. The same kind of offset could happen if spurious peaks are detected by the charger, so it is advised to limit the use of repeated continuous mode requests to fully validated setups. 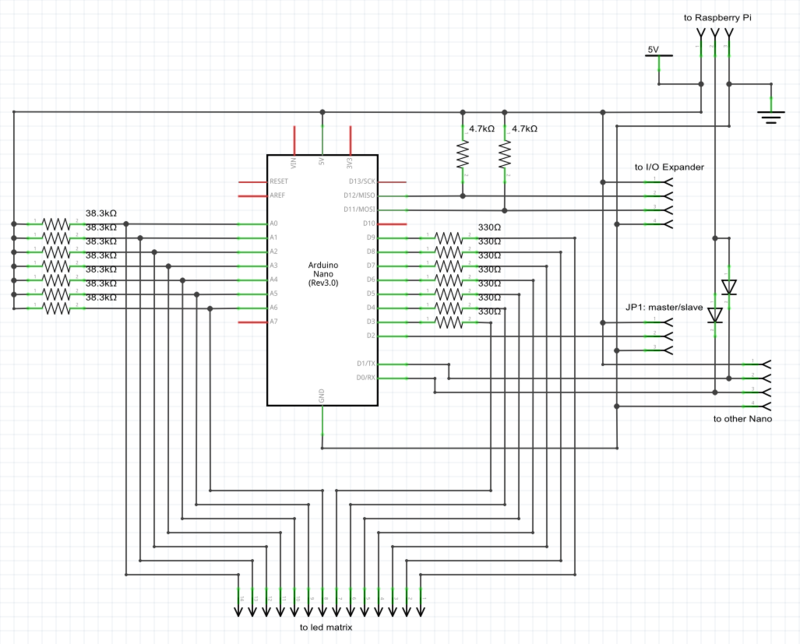 Note: Why keep 2 circuits and 2 implementations ? In other words: why not get rid of the legacy circuit? 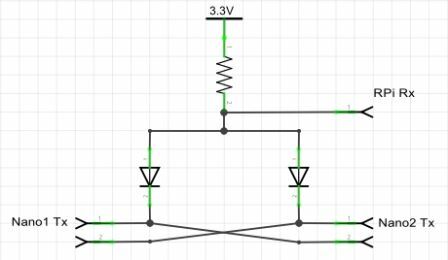 The 3-wire "legacy" circuit is kept because it adheres more precisely to the QC specification. 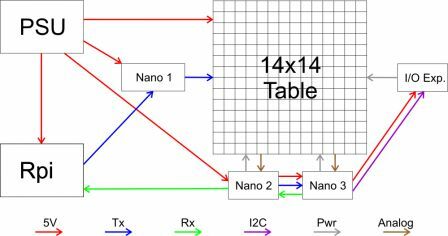 Indeed, according to the spec, the handshake should only drive the D+ wire while the D- wire is left floating (high impedance) until the charger has removed the short between D+/D- and activated a 15K pull-down on D-. This high impedance state can be achieved by letting the resistors of the D- divider "unconnected" (or connected to Arduino pins configured as inputs). That is what the library does in "3-wire" configuration. 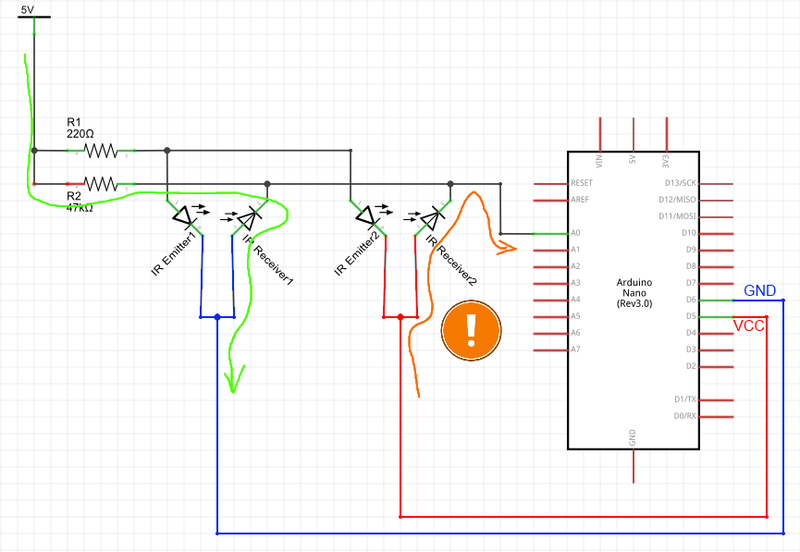 The 2-wire "recommended" circuit has no way to leave D- floating because the divider is always connected to VCC and GND. 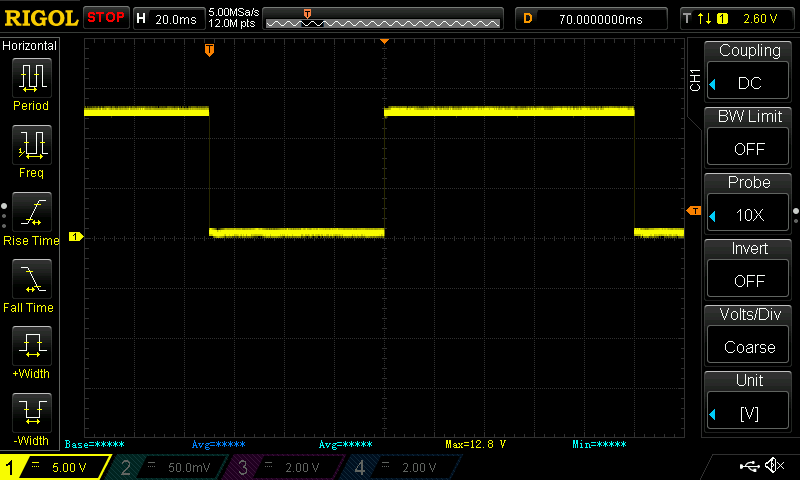 During the phase when the charger has D+/D- shorted, having both dividers producing 0.6V gets unnoticed by the charger (because they are shorted anyway). 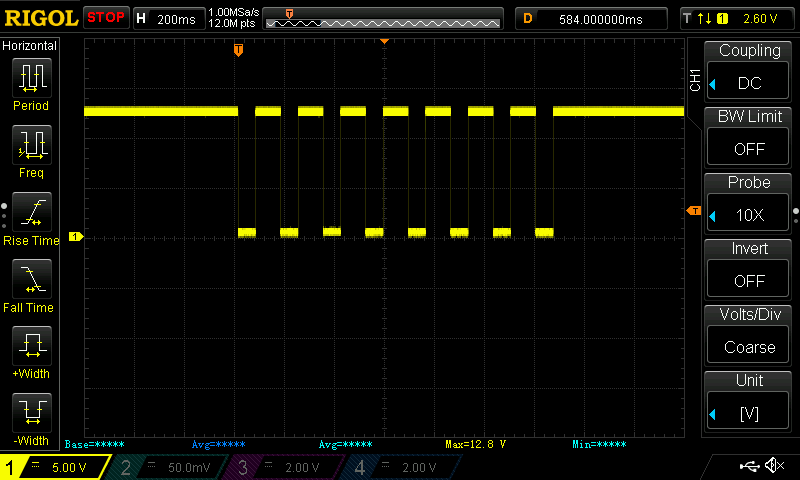 However, when the short is removed, D- is expected to immediately be pulled down to 0V by the charger's internal 20K resistor, but the divider prevents that due to its lower (10K/1.5K) resistor values, and D- remains around 0.6V. The library thus forces D- low after a delay by setting DmPin to 0V, and that gets recognized by both my chargers as an "acknowledge" of the QC handshake. 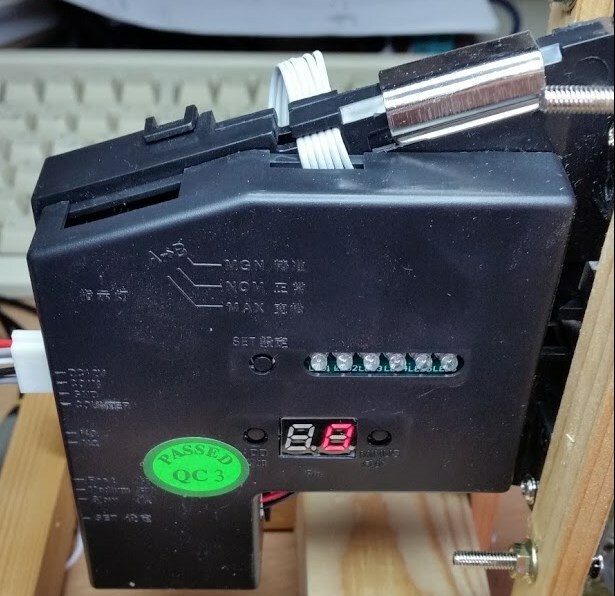 I just finished testing this coin acceptor and I thought I'd write about it because it can be tricky and many sample codes I found on the net can lead to errors in coin identification. 1) configure the number of kinds of coins to recognize and, for each of them, How many of samples will be used for learning that kind of coin, the number of Pulses to generate when that kind of coin is detected, and the Filter precision for that kind of coin (1=restrictive, 30=loose). 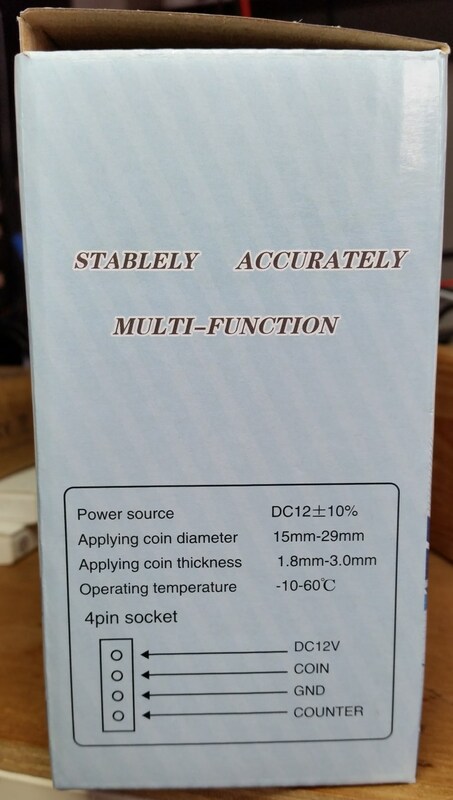 Although the documentation above says the working current is 65mA, the peak when detecting a passing coin is well above 100mA, so make sure your power supply is able to provide current peaks. I suggest a 1A power supply. 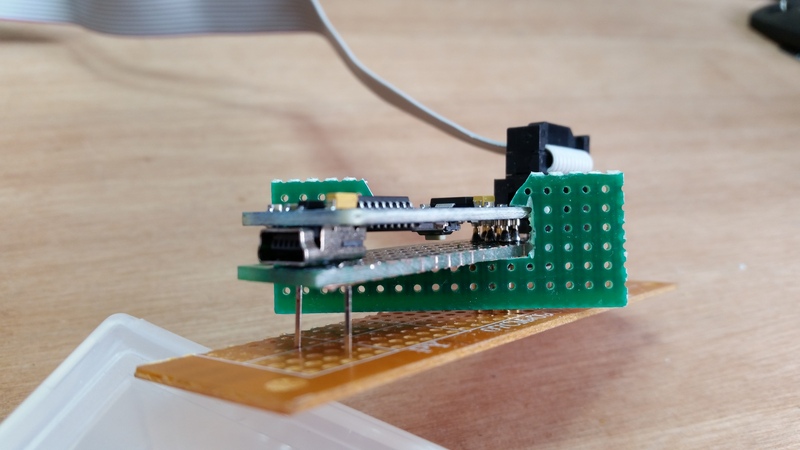 Many uses on the net show the COIN line directly connected to an Arduino or RPi input. On my model, the COIN line can be in two states : floating or connected to ground, so a pull-up must be connected to it in order to measure voltages. It can be an external pull-up resistor, but it's much simpler to configure the GPIO it's connected to as INPUT_PULLUP of course. 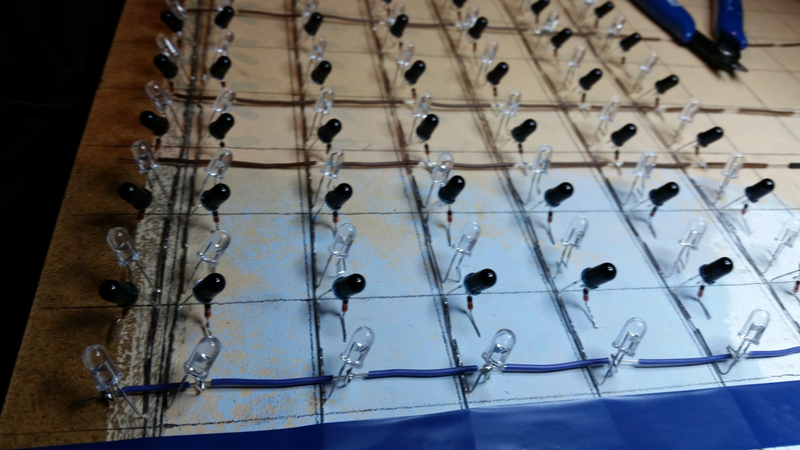 Using a switch on the back, one can choose the IDLE state of the COIN line to be floating (normally open, NO) or set to GND (normally closed, NC). 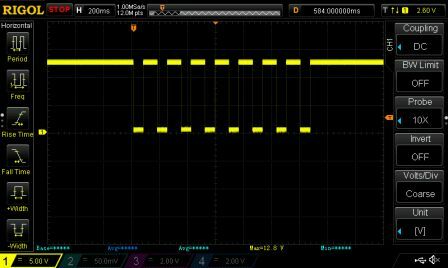 Most samples on the net use the most intuitive "NC" which makes pulses go up to VCC, but I personally chose NO to avoid wasting power in the pull-up resistor most of the time, which means my pulses are "going down" from VCC to 0V, but that does not really matter. As you can, there is no pause between coins, so there is no way to divide the pulse train for sure. What it means is that if you give arbitrary values to coins, such as, say, 1,2,3,4,5,6 then 2 coins of value 3 inserted quicky cannot be distinguished from 1 coin of value 6. This caveat causes a very common mistake in sample programs, and although some claim it can be solved by tuning delays, the trace above proves it's not the case. Issue #2 is "somewhat" handled by a specific "Unknown coin" case. For example, quickly inserting two $1 coins will cause 20 pulses and make the code fall in the "Unknown coin" case. However, as there is no way to return coins, unless this alerts the store manager, they will be "lost". 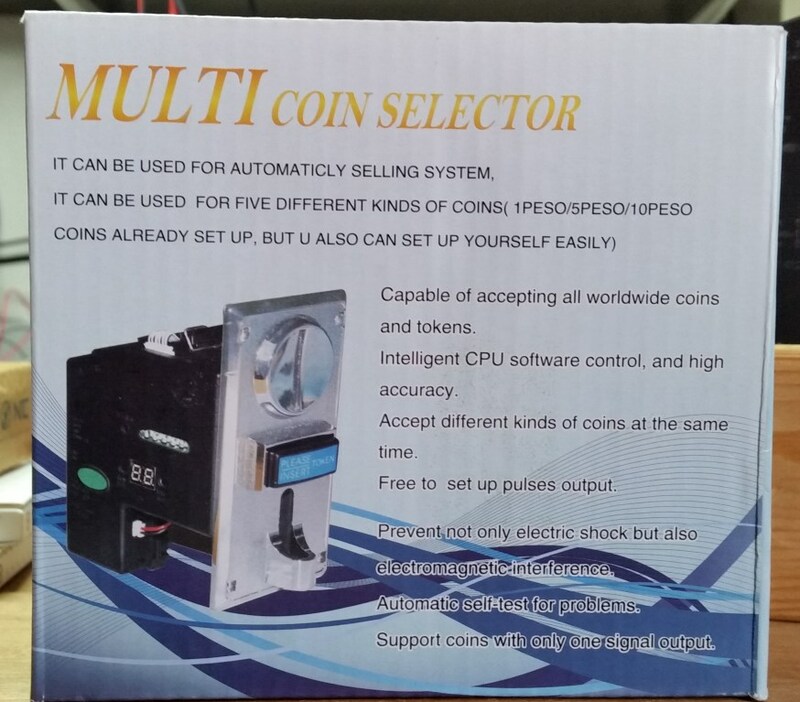 And even if the store manager gets an alert and looks at the logs, he won't be able to tell which coins were inserted to make 20 pulses: Was it 2*$1 or 4*$0.25 or another combination ? The only way to solve the "quick insertion" issue is to forget about determining "coins" and focus on "value", which means choosing a number of pulses that is proportional to the face value of the coin. But if you choose a too small unit (e.g. 1 pulse/cent), then a $2 coin will trigger 200 pulses which is both impractical (the train will last for at least 24 seconds !) but also impossible as the device is limited to 50 pulses per kind. 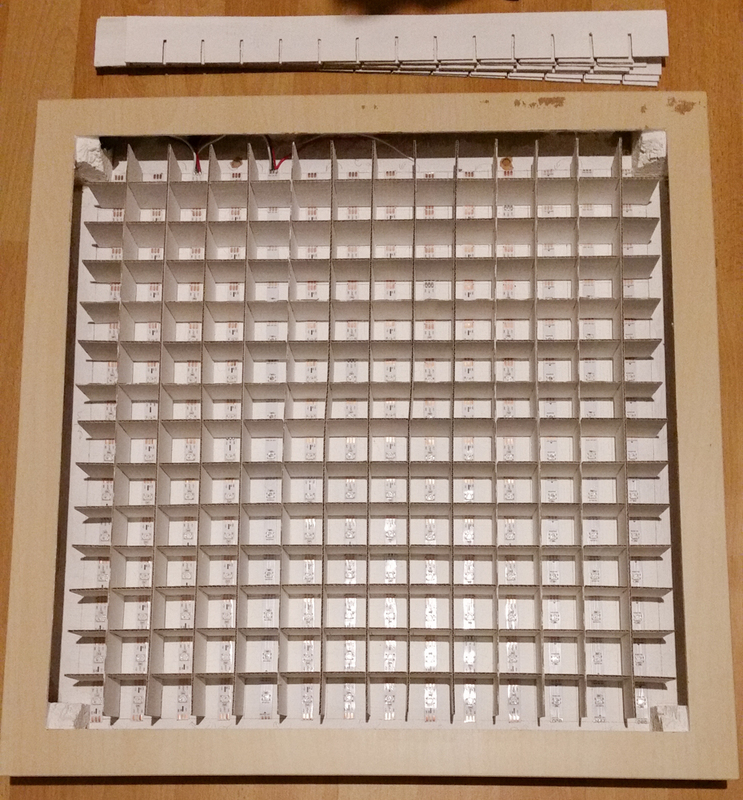 Consequently, with this device, it is impossible to reliably cover a range of coins where the largest value is >= 100 times the smallest one. For example, one will never reliably cover the full EUR or GBP range from 0.01 to 2 EUR/GBP, or even the full USD range from 0.01 to 1 USD.. 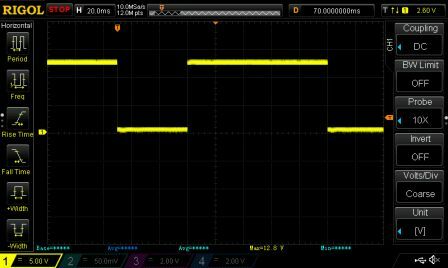 Note that some documents also speak about an "AP mode" which seems to act as a divisor and only outputs one pulse after a threshold of <n> "internal pulses" (as configured with the P-setting) has been reached. I guess the goal is that if, for example, you sell items that are worth 50cents, you will only get a pulse every time 50 cents have been inserted (no matter if it's by 0.50, or 0.20+0.20+0.10, or 5x0.10, etc.). That reduces the number and length of pulse trains you have to handle, but does not fundamentally change the range limitation of course. The sensitive solution is to cover a reduced range and give one pulse the value of the largest common divisor of all supported coins. For example, this popular Instructable covers 0.05 to 1 USD/GBP and maps 1 pulse to 5 cents. That code is safe and highly recommended. I personnally chose the 0.10 > 2 EUR range, using 1 pulse for every 10 cents. 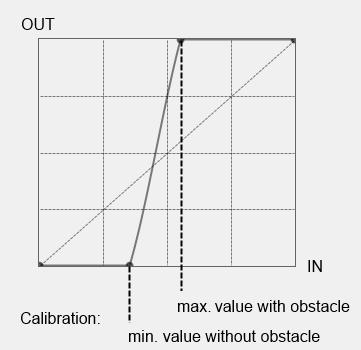 The drawback is that large values take a considerable amount of time to be decoded, and during that time, the feedback may be misleading: either you wait until the credit value is "stable" to display the credit (wait for timeout after last pulse to update display, not to count money) or you display a counter with slowly increasing value while pulses are being counted like in this video. The first can be freaky when you insert a big value and don't see any change for a "long" time, the second can be funny or unprofessional, depending on your point of view. The root cause of the issue is that the "pulse interface" is not really suited to the task. If it included a specified timeout between coins, the number of pulses per kind of coin could be greatly reduced. 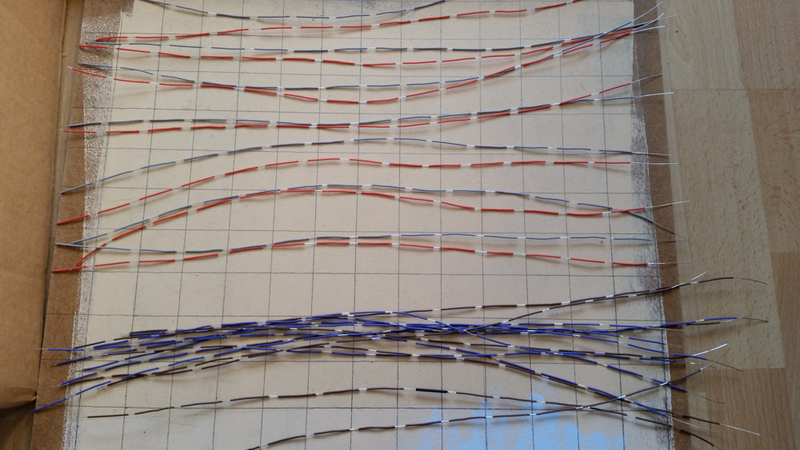 If the train was much faster (shorter pulses, shorter delay between them), then the "counting" phase would go unnoticed. This sluggish interface is particularly disappointing because the coin recognition itself is remarkably fast. Indeed, the 7-segment leds on the side of the device react almost instantly to coin insertion. 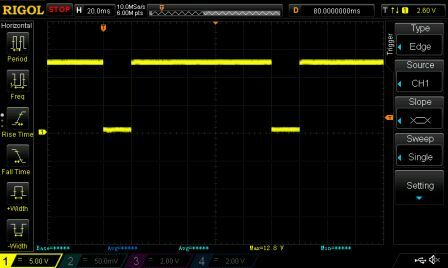 One clever guy realized that the pulse interface could be dropped completely and replaced by decoding the values sent to the 7-segment controller via SPI. The C code is available but unfortunately, not much information is given regarding required connections. I thought of doing the same but discoverd there were two other ways. 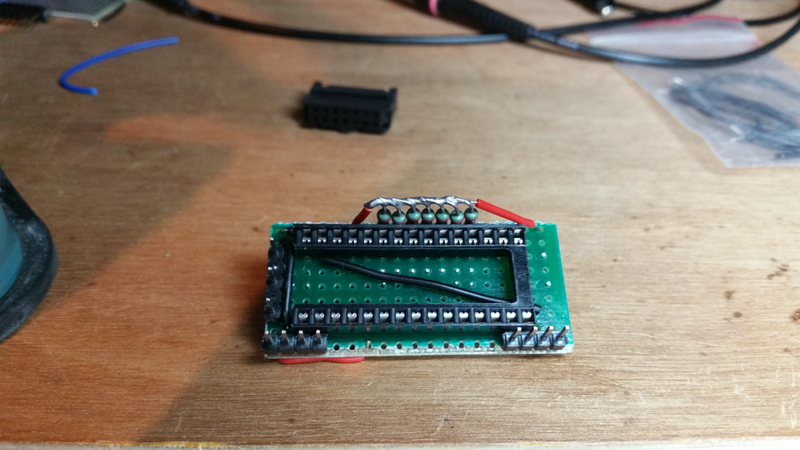 First, my CH926 has a debug port at the bottom.of the board. 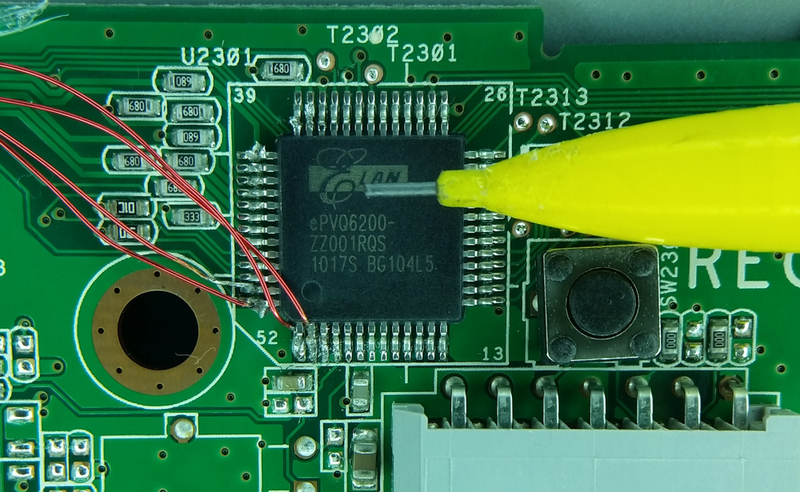 with a slightly unusual connector (6-pin JST PH with a pitch of 2mm). Following the tracks, one of the pins is directly connected to the serial TX pin of the main chip (a 20-pin STC12C5608AD). The serial is 19200 8-N-1 and the output on this port is 6 + 4 bytes each time a coin is inserted, with a long pause in between. Although I have no idea what the individual values represent, one can notice that they all range between 000Fh and 018Dh, and that they are very similar among coins of the same kind, so those data are probably raw measurements from the sensors sent out for debugging purpose. 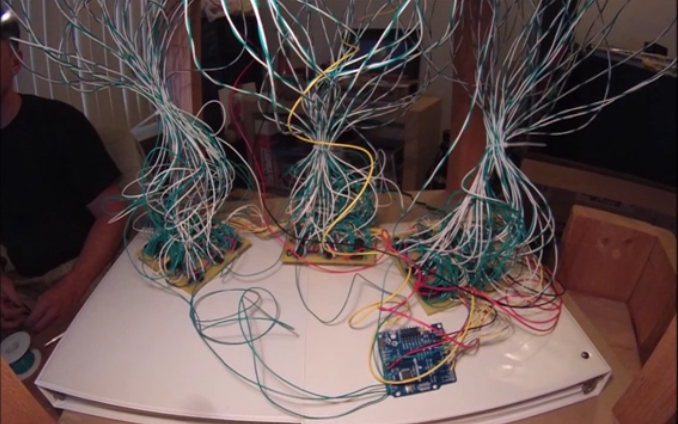 Basic spying on those wires showed that for each recognized coin, a pulse of 150ms is flashed on the led. Cool. ... but unfortunately, there are some glitches that have to be eliminated. 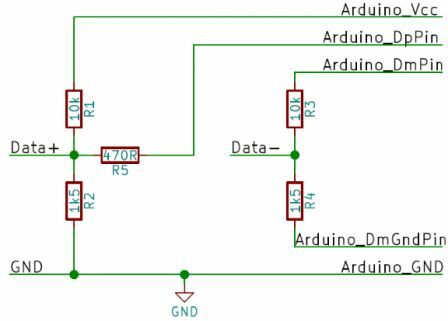 These issues can be solved with pull-down resistors (1K to 10KOhm) and with a delay in the setup() of the Arduino, which should ignore the boot sequence if the power supply is common to the coin acceptor and the Arduino. 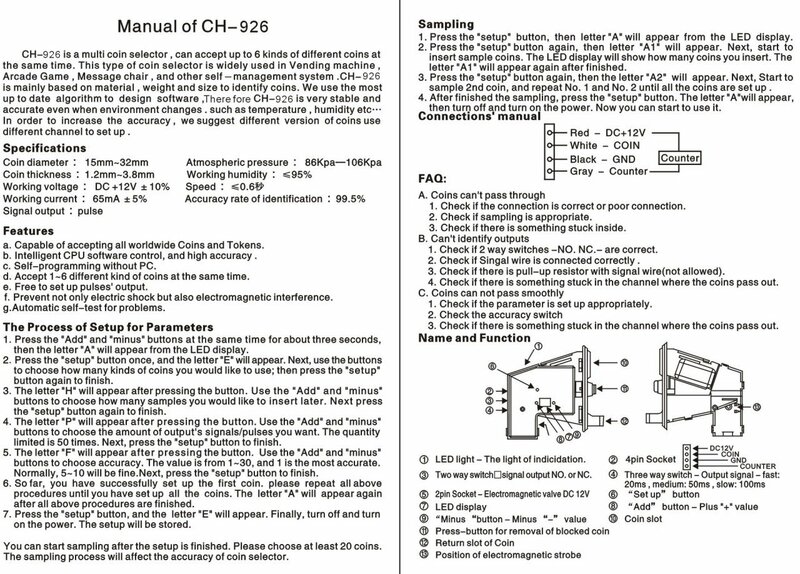 The CH92x is a very reliable device but it requires careful software design to avoid its pitfalls. 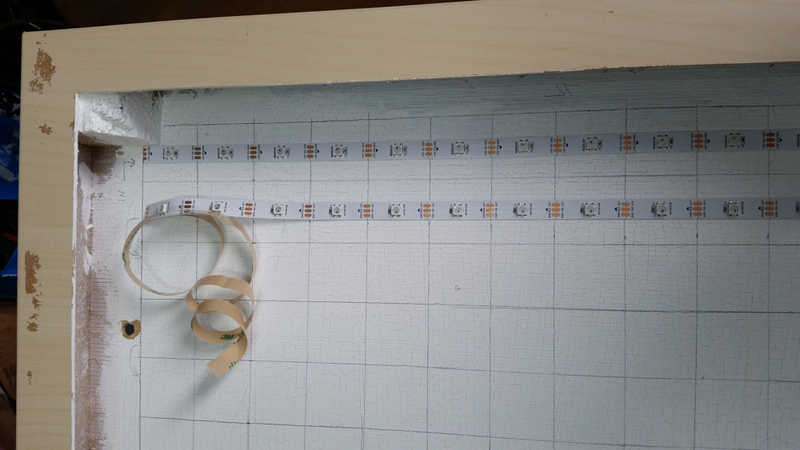 If you don't want to modify the led interface, I advise you to stick to a proportional count of pulse with respect to the coin value, and use an animation to give feedback to the user while you count the pulses. 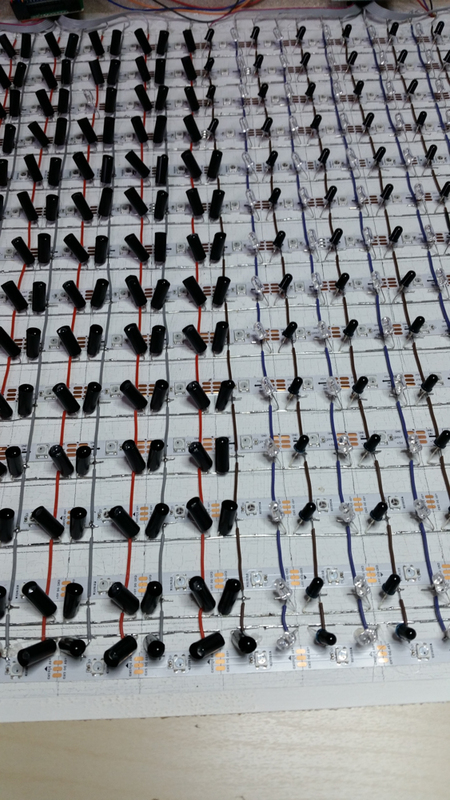 If you want the fastest response and have a model that has individual leds for each kind of coin, I think it's the best way to interface it. Pour référence : X Ambassadors "Renegades" (2015) vs Gerald de Palmas "Tomber" (2002), écrit par JJ Goldman. 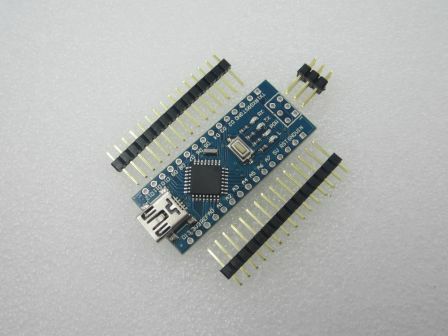 I'm a huge fan of cheap Arduino Nano clones that you can find for less than 2 USD (shipping included) on AliExpress and the likes. 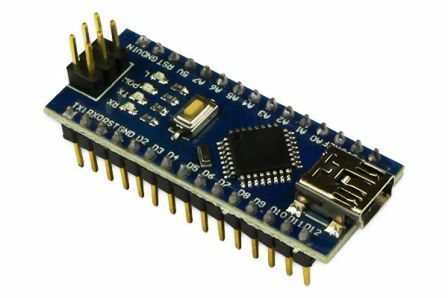 They use an obscure CH340 USB/Serial controller instead of the expensive FTDI one of official Arduinos, but since the FTDIgate, I'm happy to steer clear from FTDI alotgether. The driver is in Chinese so you are greeted with weird messages upon installation, but apart from that, it works flawlessly. What is great with the Nano design is that, as it includes a serial/USB chip (just like the big Arduino Uno), you don't need any specific hardware to (re)program it using the Arduino IDE. 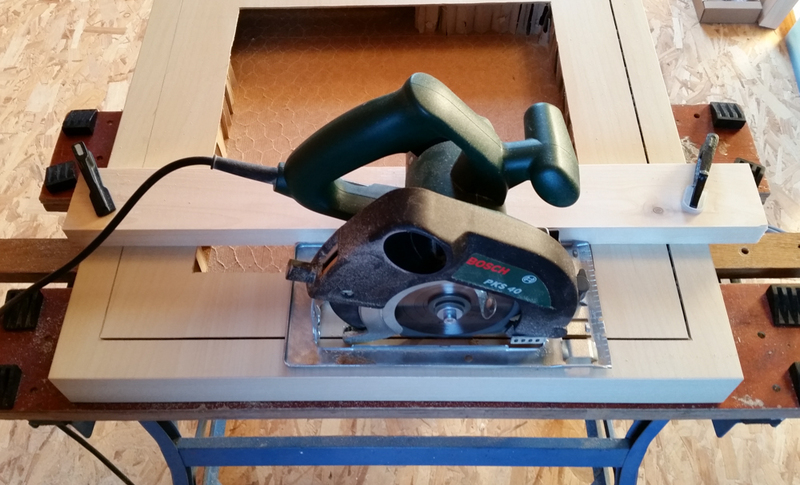 However, it is much smaller and cheaper, so it's the perfect candidate for small "set-up and forget" projects. 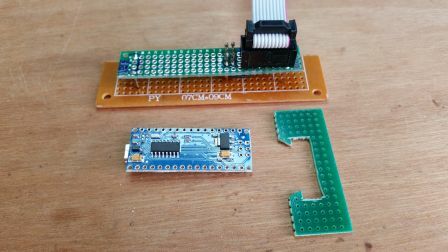 Probably for economical reasons, the cheapest clones don't have a bootloader burned in, so this has to be done once and for all (nothing complicated with a small USB ASP programmer and the Arduino IDE). 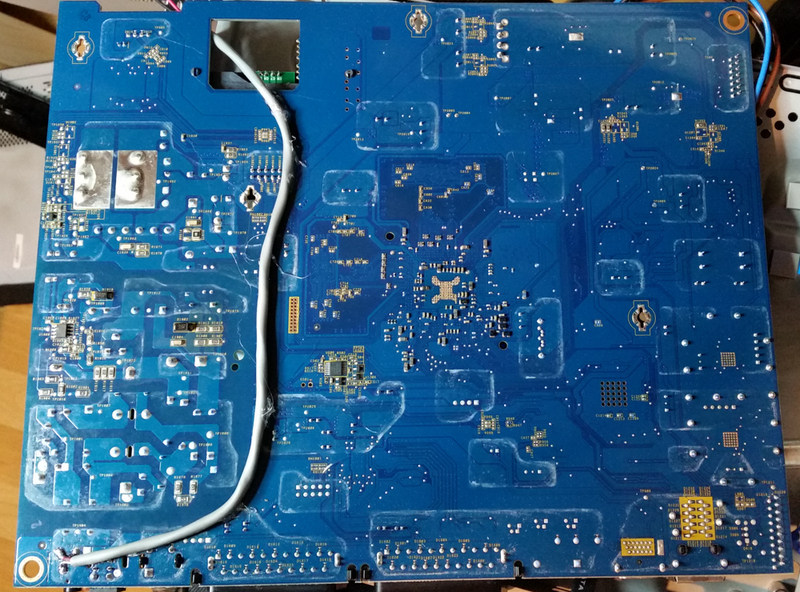 For the same reason, and probably to avoid damages when shipping, those also don't come with the headers soldered, which is a good thing, because you're free to keep them bare and include them in small enclosures, or to populate the headers if you prefer. So I ordered a pack of those. 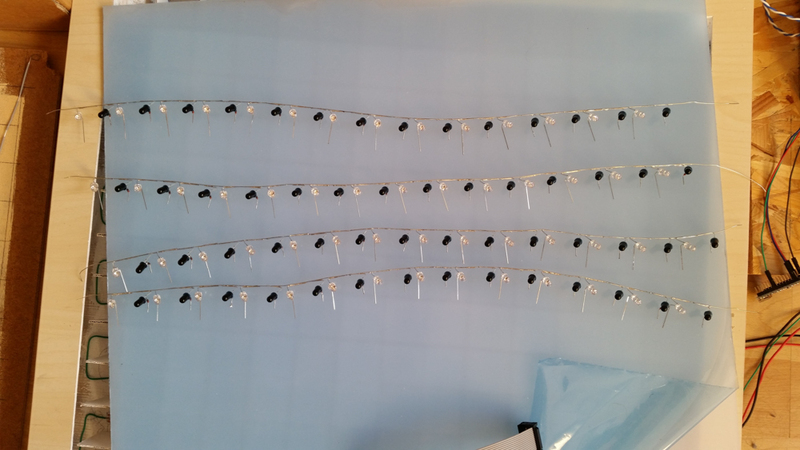 Notice the nice "clip" that guarantees a sufficient pressure so that the contact on the pogo pins is firm and stable. Trying to write an emulator, I had a hard time finding back how stepwise division was implemented. I think I now have it, so I'm going to share it here in the hope it can be useful to others. Binary stepwise division is exactly like performing a division by hand, so let't remember how it works. how many times does 12 fit in 15 ? Answer : 1 So 1) note "1" as the second digit of the answer and 2) subtract 1x12 from 15, that is 3, and there is nothing left to bring next to it. We're done. So we have the quotient : 11 (the two 1's found at each previous step), and we have the remainder : 3 (found at the end of the last step). So we always have to perform as many steps as the width of our numbers, 3 in the above case. That's when we know we're done. Quotient A=011, Remainder B = 003. See if the divisor fits into the buffer. OK. Now imagine we do the same with binary numbers on 8-digit (8-bit) : We want to divide 10000111 (=135 in decimal) by 1100 (=12 in decimal) . 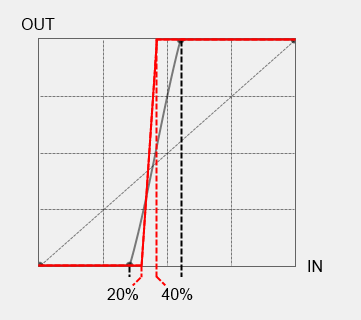 The operations we do are : Start with B = 0 and A = 0.
load one more digit from the dividend (1) into the buffer : B = 1. How many times does 1100 fit in 1 ? Answer : 0. So note "0" as the 1st digit of A and leave 1 in B : B = 1.
load one more digit from the dividend (0) into the buffer : B = 10. How many times does 1100 fit in 10 ? Answer : 0. So note "0" as the 2nd digit of A and leave 10 in B : B = 10.
load one more digit from the dividend (0) into the buffer : B = 100. How many times does 1100 fit in 100 ? Answer : 0. So note "0" as the 3rd digit of A and leave 100 in B : B = 100.
load one more digit from the dividend (0) into the buffer : B = 1000. 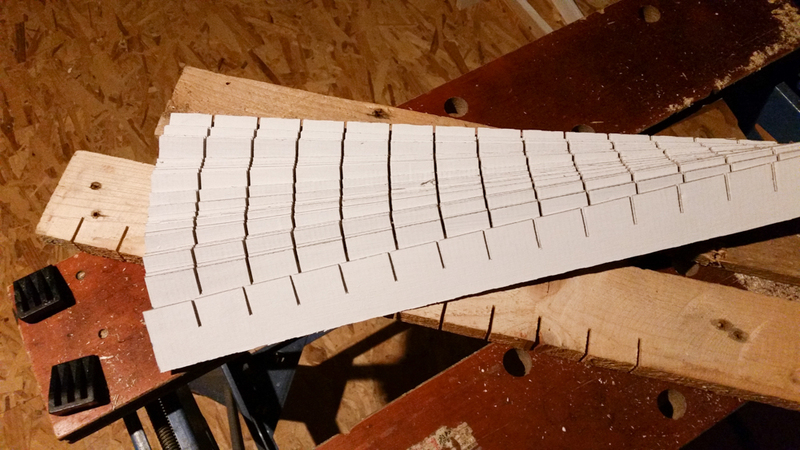 How many times does 1100 fit in 1000 ? Answer : 0. So note "0" as the 4th digit of A and leave 1000 in B : B = 1000.
load one more digit from the dividend (0) into the buffer : B = 10000. How many times does 1100 fit in 10000 ? Answer : 1 (take care, we're in binary. In binary it can just be 0 or 1 in any case). So note "1" as the 5th digit of A and store the difference (100) into B : B = 100.
load one more digit from the dividend (1) into the buffer : B = 1001. How many times does 1100 fit in 1001 ? Answer : 0. So note "0" as the 6th digit of A and leave 1001 in B : B = 1001.
load one more digit from the dividend (1) into the buffer : B = 10011. How many times does 1100 fit in 10011 ? Answer : 1. So note "1" as the 7th digit of A and store the difference (111) into B : B = 111.
load one more digit from the dividend (1) into the buffer : B =1111. How many times does 1100 fit in 1111 ? Answer : 1. So note "1" as the 8th digit of A and store the difference (11) into B : B : 11. Quotient : A=00001011 (=11 in decimal). Remainder B = 11 (=3 in decimal). Good news is : we have the same correct answer in binary. Smarter yet, each digit of A, as it is calculated, can be fed as the last digit of a register that would be shifted left by 1 at each turn. Wait, we just have such a register : that's RL. Each time it gets shifted left to feed RH, it leaves the last digit of RL free to be used as the next digit of A. 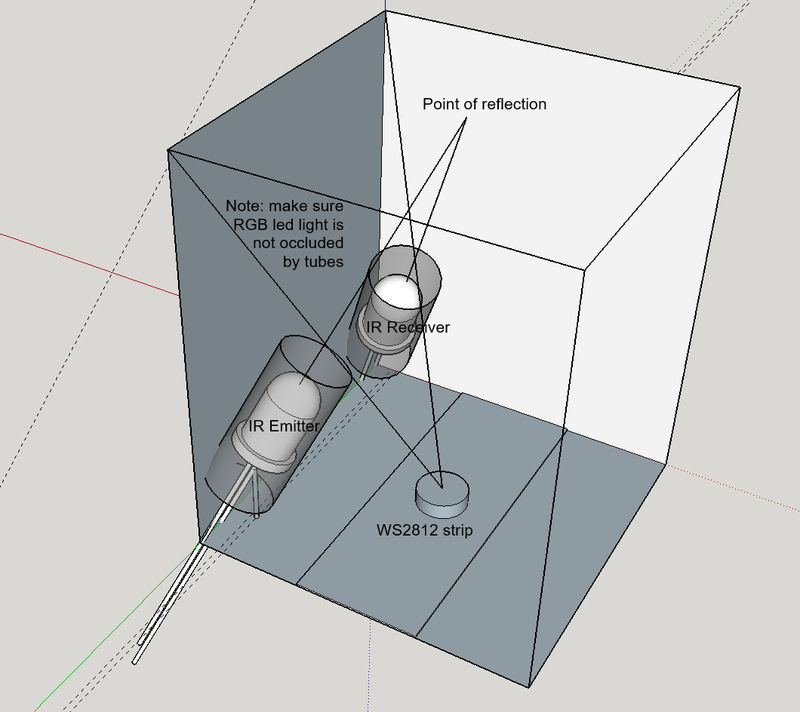 So in the end, we'll have the anwser A built bit by bit in RL, and the remainder in RH. Great ! If you're only interested in unsigned divisions, you can stop now. That's all there is to it. a few correction steps once the division is complete. 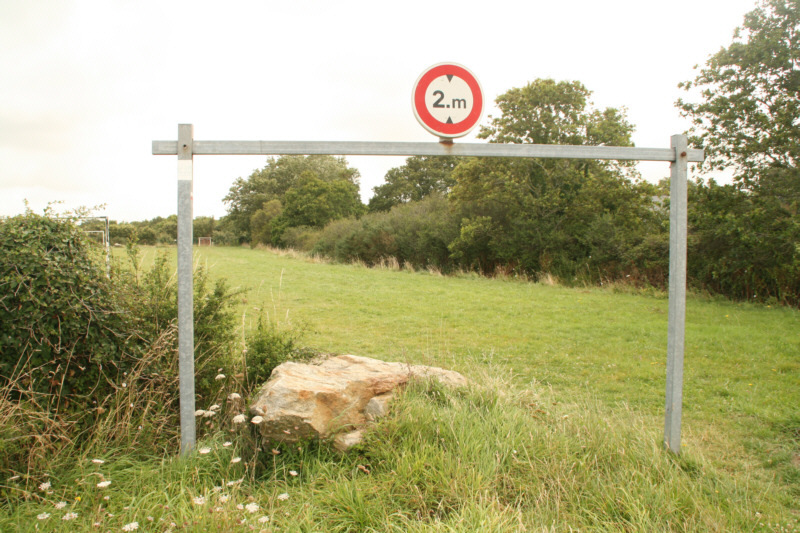 En clin d'oeil, deux panneaux routiers qui laissent perplexe... Le premier à Bruxelles, à deux pas de la RTBF, avertit que l'on croise un tram à ... 1m. 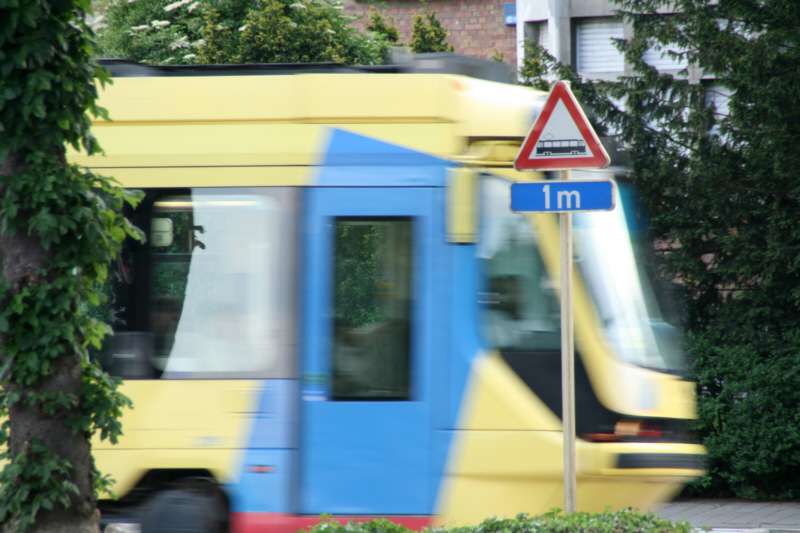 Pas d'illusion d'optique, le tram passe bien 1m derrière le panneau. A quand "Tram à 50cm" ? 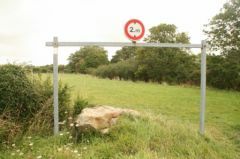 Le second est en Bretagne, à Saint Colombier, et laisse aussi assez circonspect. Pas de montage ni de truc non plus, le portique enjambe bien cet énorme roc... Voir les lieux exacts sur Google Maps. While I appreciate Ant for automating java projects build, I still often find cases where I go "jeez, it would have taken two lines in a Makefile and I can't see how to do that with Ant"
Last case I came across: I have a bunch of JPG files and I want to make GIF thumbnails from them. ImageMagick does the job pretty well, but I want to automate the operation so that only newly added or changed JPG are reprocessed at each build. Plagiat ? 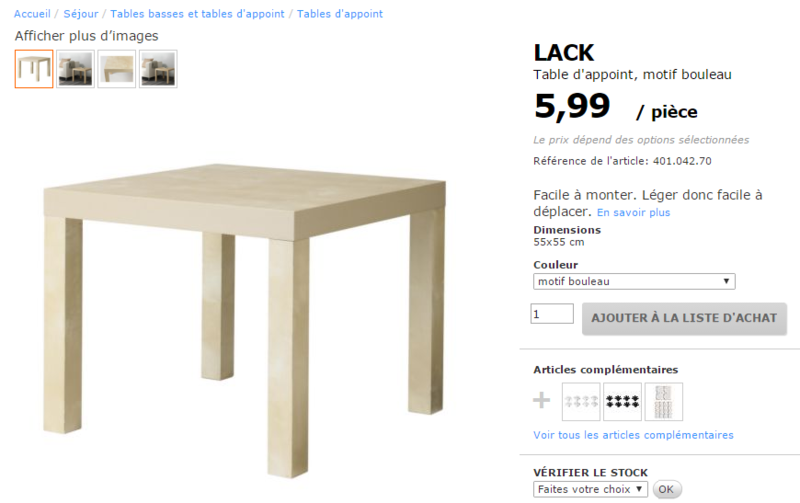 Hommage ? Hasard ? Franchement, la manière dont les drivers déclarent les capacités du matériel qu'ils gèrent est vraiment obscure. Et en matière de vidéo, trouver la bonne combinaison driver/player revient le plus souvent à de l'essai-erreur. Bon, les résultats des drivers JMicron étaient atroces. Après pas mal de recherches, je suis tombé sur des posts qui conseillent de basculer le JMicron en mode RAID dans le BIOS. Tentative suivante : désinstaller le driver JMicron tout en laissant le BIOS sur RAID. OK, mais au reboot, il dit qu'il y a un nouveau matériel (contrôleur RAID) et cherche le driver. Introuvable, soit... Résultat : plus de disque dur :-(. Paaaas bon. Enfin, retour à la case départ : passage du BIOS en mode IDE. 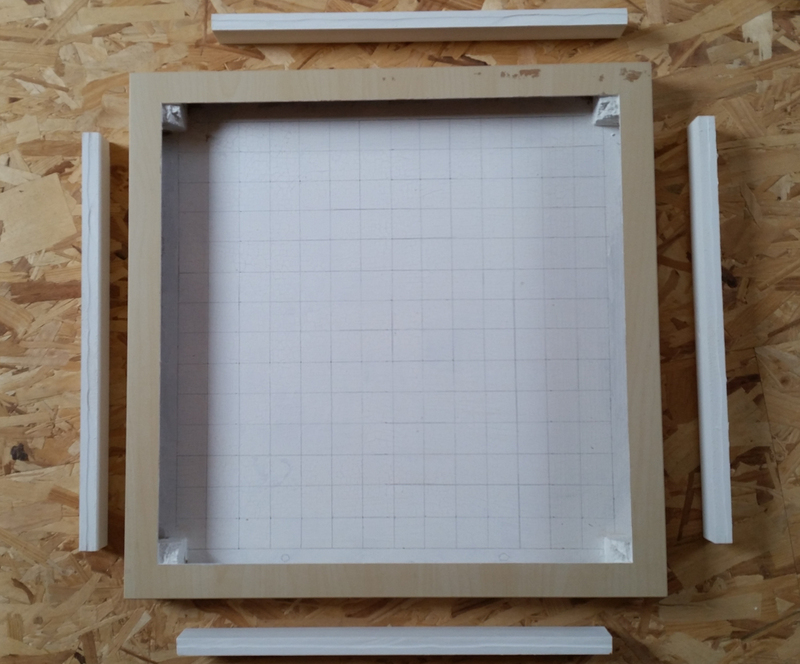 Tout redémarre, et plus de souci côté accès disque (ouf). Dans le gestionnaire de périphérique, le DVD est maintenant en ... UDMA4 ! La fin des DRM ? Steve Jobs (Apple) propose dans une lettre ouverte la suppression pure et simple des DRM comme la meilleure voie pour ouvrir la compatibilité fichiers / lecteurs dans le marché de la vente de musique en ligne.